THE GIRLCOTT | Boycott means saying no. Girlcott means saying yes. The Girlcott is designed to drive demand for a healthier cosmetics and personal care industry through Awareness, Action, Alternatives and Advocacy. But how did we come up with this name and what does it mean? If you Google the word, “girlcott,” you may land on a reference to an effort organized in 2005 by a group of high school girls in Allegheny County, Pennsylvania to protest the sexist slogans printed on t-shirts sold by retailer, Abercrombie & Fitch. These girls launched an email campaign to encourage other teens NOT to shop at Abercrombie & Fitch, which in turn inspired significant media coverage. The negative press and consumer backlash prompted the brand to remove several of the offending t-shirts and issue an apology to the girls. They coined the term, girlcott, and we applaud these young women for stepping up, speaking out and taking an important stand about an issue they were passionate to embrace. "However, the real origin for our movement comes from author, Stacy Malkan, whose superbly researched, eye-opening book, Not Just a Pretty Face: The Ugly Side of the Beauty Industry, references the word girlcott by Dr.Devra Davis--a scientific leader in efforts to promote safer and healthier products. During an interview with renowned cancer researcher and author, Dr. Devra Davis, Malkan passes along Davis’ advice, “the simpler the better,” when it comes to choosing safer personal care products. Their dialogue continues to reflect their mutual recommendations about how to gradually replace the many items on our shelves that have the potential to cause us harm. By taking a u-turn away from just saying no in the form of a traditional boycott, we are attempting to shift the paradigm to a positive direction of consumer influence. Similar momentum is building in the organic food industry where customers are allocating ever more precious dollars to groceries that avoid harmful ingredients such as pesticides, additives and genetically modified ingredients. We hope to offer an example of how to empower women and their families to embrace healthier alternatives as well as advocate for new standards to shape industries that profoundly affect all of us. The Girlcott is a consumer model for the future. We are providing a strong message to the marketplace. We are guiding our government to protect us. And we are moving forward with solutions to problems of monumental importance to today’s society. Everyone has a voice. Everyone has a choice. Everyone is invited to support The Girlcott! 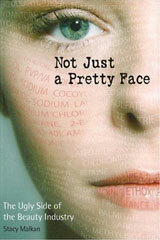 Please join us April 18th at 1pm to hear our special guest, Stacy Malkan, Co-founder of the Campaign for Safe Cosmetics, and author of the book, Not Just a Pretty Face. Her talk is sure to educate, enlighten and inspire us all!